The principles of ABM are increasingly integral to B2B marketing. This is no surprise. ABM’s track record at delivering a higher return on investment than other marketing approaches has been well-catalogued. But what will be the potential impact of powerful economic, technological, and social trends on how we operate? 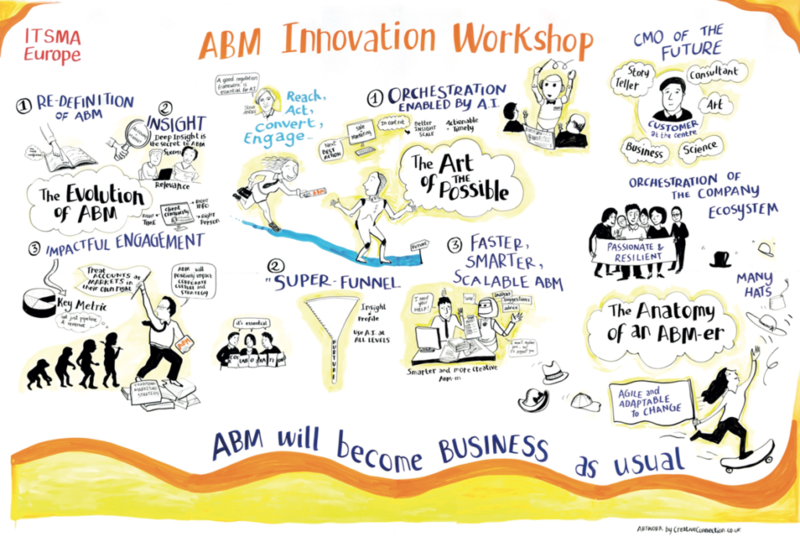 We recently brought together a group of senior executives from companies with advanced ABM programs, including Accenture, BT, DXC Technology, Fujitsu, Microsoft, and O2 to brainstorm ABM’s future. How will artificial intelligence help us deliver it? What will the ABM-ers of the future look like? Figure 1 captures the essence of the discussion graphically. Does ABM’s very popularity mean that the term itself is in danger of being diluted from indiscriminate application? This generated intense discussion, with some practitioners arguing that we need a new description to single it out from more targeted, mass marketing activities that have piggybacked onto the concept. While that discussion will continue, we did agree that we have to be clear just what ABM is – and what it isn’t. ABM is a re-orientation of the company from the outside-in. In other words, ABM is about orchestrating the entire firm for the benefit of the client. This has to cut across functions, departments, and internal silos. By focusing on this framework of collaboration, ABM begins to drive changes in corporate strategy and culture, for the mutual benefit of the company and its clients. Deep client insight will remain at the heart of successful ABM. It makes what we do relevant to each individual in the client’s firm by getting the right information to the right person at the right time. And there are new tools, techniques, and ideas to help us collect and analyze it emerging at breathtaking speed. But we have to go one step further and strengthen engagement, identified in this year’s ABM Benchmarking Survey as a key metric for ABM practitioners. Filling the pipeline and growing revenues remain critical measures. It is impactful engagement that will make that crucial difference to our client relationships. Artificial intelligence (AI) will give us the tools to make ABM faster, smarter, and more scalable. No, we can’t deliver human-like conversation with bots – yet. But technology will help us manage and manipulate the avalanche of data we collect while giving us time to focus on the more strategic and creative aspects of our jobs. AI will also make us more efficient as budgets get squeezed and resources kept constant. The demands on the ABM-er continue to be daunting. ABM is both art and science, so good ABM-ers will have to wear many hats. They will need to be adaptable, agile, and keep a close eye on the bottom line. They will also have to be passionate and resilient and tell stories that engage and persuade both internal and external audiences. But it will be worth it: proving that they can orchestrate the organization from the client’s perspective will give prospective ABM-ers powerful career leverage. ABM will be a rite of passage for future CMOs. As the workshop participants concluded, the overarching theme is that the ABM-ers of the future must be instrumental in orchestrating their company around the client’s world and not their own, internal structure. This will be based on continuous insight, enabled by technology, and delivered through agile working. Marketers will play a leadership role. And ABM will become business as usual.